I can't believe how fast the weeks are going by, it feels like only yesterday I found the #MySundayPhoto link up and now it is week number 3! We are again linking up to One Dad 3 Girls for this wonderful link up. This week I wanted to share with you a photo of something different in our beautiful city and although there where some lovely pictures from this week, I chose this one. I didn't just choose this picture just because I liked the bright lights in the dark sky but because this week I also learned the meaning of this sculpture. When this sculpture first went up it was the talk of the city, nobody understood what this was or why it was there. There is no explanation near the sculpture nor is there a name. This sculpture is 123 ft high and 98 ft wide ( it really is huge! ), it is located on a busy roundabout at a junction on the motorway in Belfast. 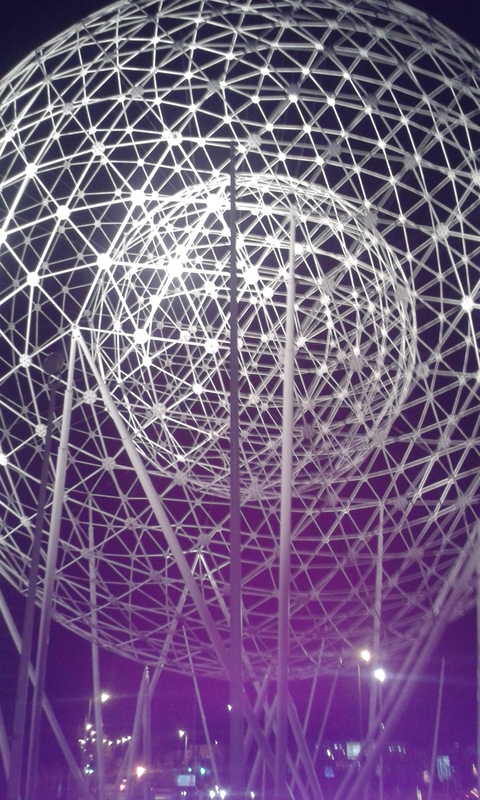 The sculpture is called Rise and is the work of Wolfgang Buttress and the representation of the sculpture is the rising of a new sun which is to signify the beginning of a new Belfast. What better reason do we need to light our city in a new light? Brilliant photo, and great story behind it! I haven't been over to Belfast in years, last time was in the early 90's when as an outsider didn't feel particularly safe! So need to go back as every person I have met from there has been fantastic! Yes you can it can be seen from many places all over Belfast! Wow! You should come back, we are all much friendlier now! Haha a lot has changed from the 90's. It does feel much more grand to stand underneath and look up. It is rather beautiful in a unique way at night when it has lit up. Thank you. It is pretty grand and very unique! that is so wonderful.. we have a statue here in brisbane by wolfgang buttress too called Venus Rising. he came out here to finalise the erection of it and i went to a talk by him. i just love it. Oh how exciting! I do love a good bit of his work. It is all so inspirational and the meanings behind them.